Annual Dog-Day Cicadas (Tibicen spp. ; family Cicadidae) emerging in southwest Ohio are being “welcomed” by their nemesis, Cicada Killer Wasps (Sphecius speciosus). This is the largest wasp found in Ohio and the annual cicadas are their select prey. Listen carefully for an abrupt halt in the buzzing of a cicada, often punctuated by a high-pitched screech; this usually means a killer has committed an insecticidal act. 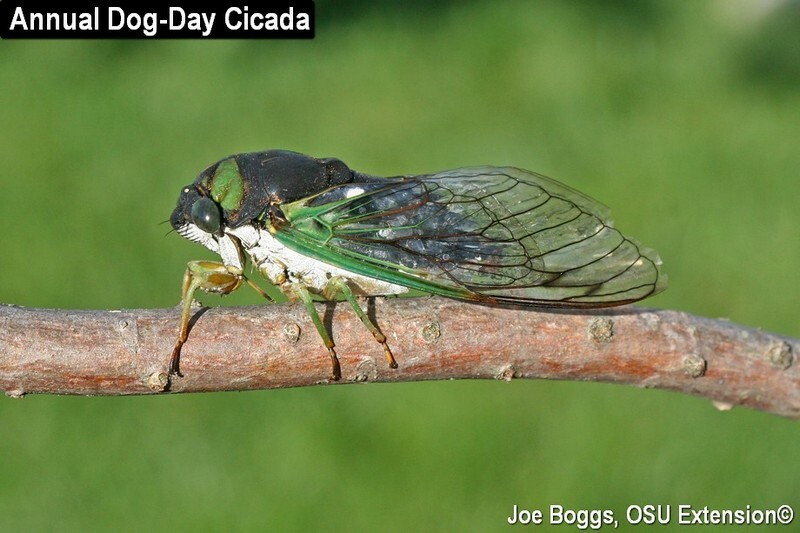 Annual dog-day cicadas share several behavioral traits with periodical cicadas (Magicicada spp. ; family Cicadidae). The nymphs of both types of cicadas develop underground sustained by juices sucked from tree roots and it takes multiple years for them to complete their development. Periodical cicadas are so-named because it takes 17 or 13 years for nymphs to complete their development with adults emerging en masse in spring. It takes 2-3 years for dog-day cicada nymphs to complete their development; however, some adults emerge every year due to overlapping generations. The adults appear sporadically throughout the “dog days” of summer usually beginning in July. Like their periodical familial cousins, dog-day cicada males also "sing" to attract females. However, the sound of an occasional dog-day cicada buzzing to entice a female doesn't compare to the cacophony created by a multitude of periodical cicadas; a barbershop quartet doesn't compare to a million man chorus! Cicada killer wasps measure 1 1/8 to 1 5/8" in length. As with all hymenoptera (wasps, bees, etc. ), only the females possess stingers (ovipositors); however, they are not aggressive. The males are aggressive, but they lack stingers. The females spend their time digging and provisioning burrows with paralyzed cicada-prey. They prefer to dig their brood burrows in bare, well-drained soil that is exposed to full sunlight. Although the wasps are considered solitary, all of the females have the same nesting requirements. So it is not unusual for there to be numerous burrows, and wasps, in relatively small areas. The males spend their time establishing and defending territories that encompass multiple females. They are notoriously defensive and will aggressively buzz any transgressor who dares to enter their territory including other males as well as picnickers, golfers, volleyball enthusiasts, and gardeners. Fortunately, it's all a rouse since they lack the necessary equipment to deliver a sting. Cicada killer wasps feed exclusively on dog-day cicadas, so they are considered beneficial insects. However, their large size coupled with low-level flights over sand volleyball courts, sparse lawns, and bare areas in landscapes can be disconcerting generating demands for control options. Cultural practices that promote thick turfgrass will usually eliminate a cicada killer infestation in a lawn in one or two seasons. In landscapes, the wasps prefer loose soil in full sun; however, they will sometimes set-up shop in open areas that are covered in a thin layer of mulch. Deeping the mulch layer and occasionally raking to disturb the mulch or adding plants to shade the soil will make conditions less favorable for the wasps. Since this is a beneficial insect, using insecticides to kill these wasps is discouraged. Education is one of the best approaches to reducing the angst sometimes caused by these wasps.